Pearls have been worn and enjoyed for thousands of years. During Roman times it was the most prized of all gems and Cleopatra loved her pearls so much she wore them constantly. 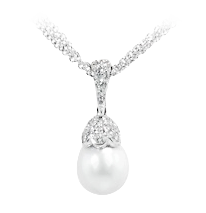 In fact, pearls are among the most timeless, classic and treasured of all gems. Throughout history, these noble gems have been associated with wisdom, wealth, purity, romance and mystery. Before the creation of Japanese cultured pearls in the early 1900's, there were only natural pearls, very rare and very expensive, available only to Royalty and the very rich and well connected. Natural pearls are pearls formed by chance. Cultured pearls have been given a helping hand by man. Today, nearly all pearls are cultured. By inserting a foreign object into a mollusk, pearl farmers can induce the creation of a pearl. From there, the same process of natural pearl creation takes place. 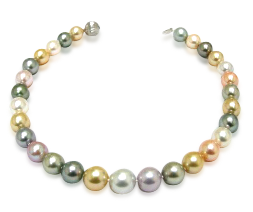 In cultured pearls, a surgically implanted bead acts as the irritant. As a defense mechanism, to protect its soft body from this irritant, the oyster secretes a smooth, hard substance called nacre surrounding the irritant and the creation of a pearl begins. Nacre is a combination of crystalline and organic substances. Layer upon layer of this coating is deposited on the foreign object and hardens; ultimately after several years, this build up of nacre forms a lustrous pearl. And of the pearls produced, only approximately 5% are of substantial quality to be made into fine jewelry offered by Kenneth Gordon. South Sea pearls, cultivated primarily in Australia, Myanmar, Indonesia, and the islands of the South Pacific, are among the largest and rarest of cultured pearls in the world. Ranging from 9 mm to 20 mm in size. Their rarity is due to the fact that growing larger pearls requires a great deal of time, during which many things can go wrong: the oysters can die, the pearl can become misshaped, etc. Thus, South Sea pearls tend to be among the most expensive of pearls, commanding high prices for quality specimens. Tahitian pearls are produced in the black-lipped oyster 'Pinctada margaritifera', in and around Tahiti and the French Polynesian Islands. This oyster itself is quite large - sometimes over 12 inches across and weighing as much as 10 pounds - which often results in much larger-than-average pearls. Tahitian pearls 12mm in diameter or larger are considered to be rare. The pearls are unique because of their natural dark colors. Most "black" Tahitian pearls are not actually black, but are instead silver, gray, charcoal, or a multitude of colors called peacock. Pearls are classified by Origin, then graded by size, shape, nacre thickness, color, luster, surface clarity and matching. For cultured pearl experts, luster is perhaps the most important indicator in evaluating cultured pearl quality. In general, the thicker the nacre, the richer the "glow" of the pearl. Luster is what separates the inferior pearl from the superior and the ordinary from the extraordinary. Surface quality refers specifically to the abundance or absence of physical blemishes or flaws. Remember the cultured pearls are grown by live oysters in nature and there are many uncontrollable forces that affect the surface. Pearls can be round, semi-round and off-round. Perfectly round pearls are the rarest and most valuable. Baroque pearls, which are asymmetrical in shape, can be lustrous and appealing, and often cost less than round pearls, but not necessarily. Cultured pearls are measured by their diameter in millimeters. The larger the pearl, other factors being equal, the more valuable it will be. Cultured pearls come in a spectrum of shades from rose' to black. These shades may be created by the oyster or dyed by man. Dyed pearls are far less expensive and should be disclosed. Matching refers to pairs or strands, and addresses uniformity of color, luster, shape, blemishes, and graduation. If colors are intentionally mixed, it refers to the attractiveness of the combination. Knowledgeable consumers learn about the quality of their pearls before they purchase them. Thanks for taking the time. We will be glad to help you.